Cultural complex 20,300 m2 GFA, parking garage 14,500 m2 GFA. 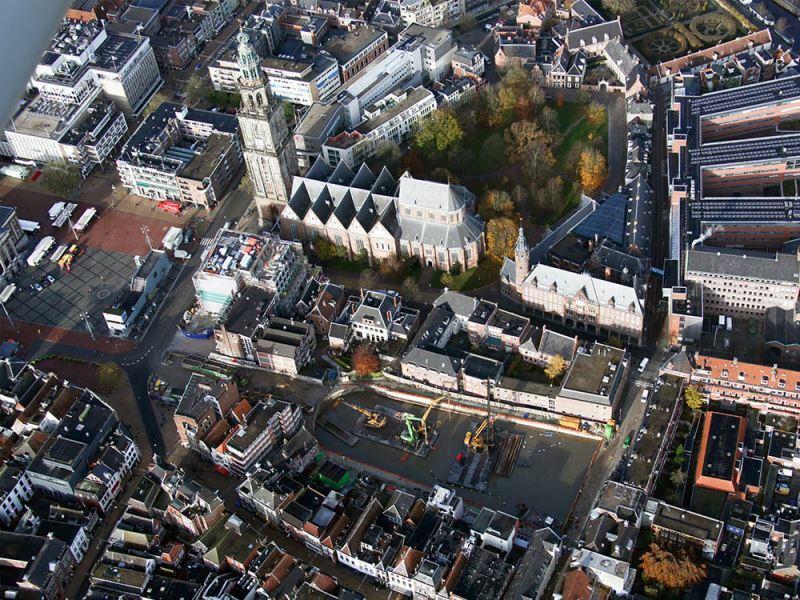 Currently in its completion stages, the Groninger Forum is expected to be able to open its doors to the public in 2017. The Groninger Forum will be a Cultural Complex consisting of 11 layers with public library Openbare Bibliotheek Groningen, the Groninger Museum, the Groninger Archives, and a cinema. There will also be a parking garage comprising five layers , which will accommodate around 400 cars and 1,500 bicycles. 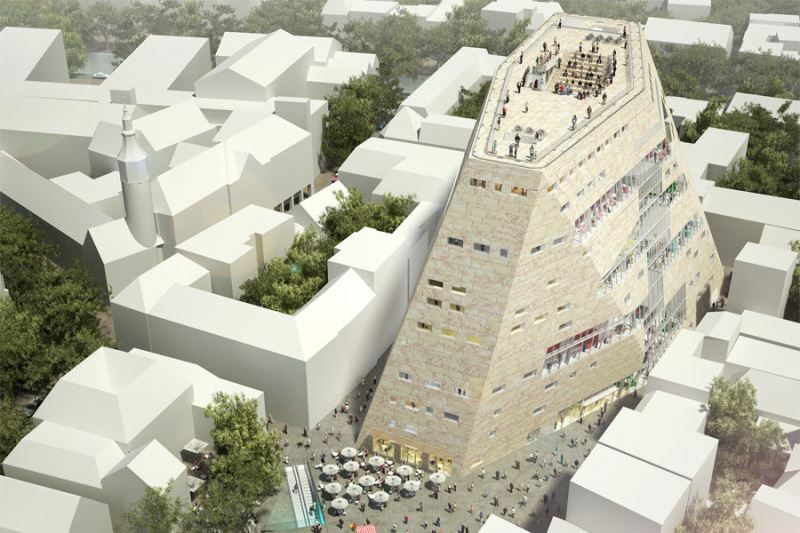 NL Architects designed an ambitious, sculptural building on the east side of the Grote Markt. The extremities of the building lean at contrary angles. Bevelled surfaces improve the incursion of light for the surrounding buildings. They add spatial attractiveness to the building. The glass atrium offers spectacular views. There was great focus on sustainability during the entire design process. As a result, energy consumption is fifty percent less than a reference building. By means of a quickscan, ABT investigated the risks of the ground caving in, in relation to an efficient construction-pit principle. A variant study led to a five-floor basement with deep retention walls, underwater concrete, tensile / compressive piles, en anchor blocks. Underwater concrete is used as a temporary bottom seal of the building pit. 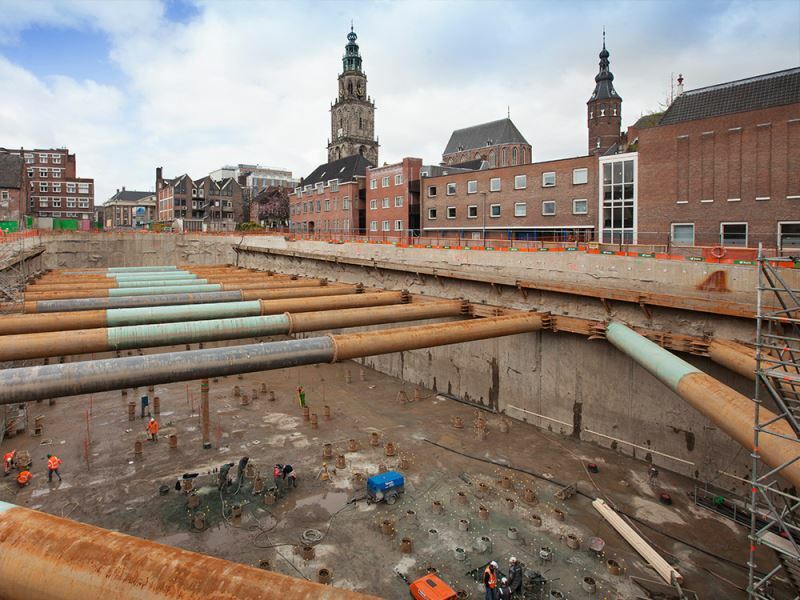 The floor contains nearly 4,000 m3 of steel-fibre-reinforced underwater concrete, making it the largest of its kind in the Netherlands. The main bearing construction comprises two concrete cores, with volumes of steel in-between, which is positioned on top of the parking garage. The architecture poses a challenge to its construction: the columns are not allowed to be aligned on any floor. In addition, the façades lean over. A spider web of bearing vertical lines is created; these lines provide driving horizontal forces as well. This irregular superstructure has to fit on top of the regular design of the parking grid of the substructure. Groninger Forum was commenced in 2007. Contrary to common practice in those days, ABT decided to provide a three-dimensional plan for this building. The technical specifications have been delivered with a BIM model serving as the contract document. In addition to the virtual collaboration, there was the physical one as well. In BIM, the elements of the subcontractor are placed over the design. This way, any deviations are detected at an early stage. Checking on the basis of drawings is definitely a thing of the past. At first, ABT was approached for the construction. As things progressed, ABT also became involved in the feasibility study, the structural design, the architectural planning, the building costs management, the general management, the geotechnical advice, and the design management. Upon request by the municipality of Groningen, ABT provides an experienced general manager, a daily manager, a chief supervisor, and special inspectors. This way, ABT became more and more involved in the project and the actual development of the Groninger Forum.